The images that didn’t quite make the cut for my MCZ selection. I love these though, the colours, and the lighting, however they didn’t quite fit into my series, and ultimately the images have to always work as a set. The stalked jellyfish (top) is probably one of my favourites in this more fine art style of photography. Despite the fact it’s probably just out of focus, I absolutely love blurring and the backscatter here. 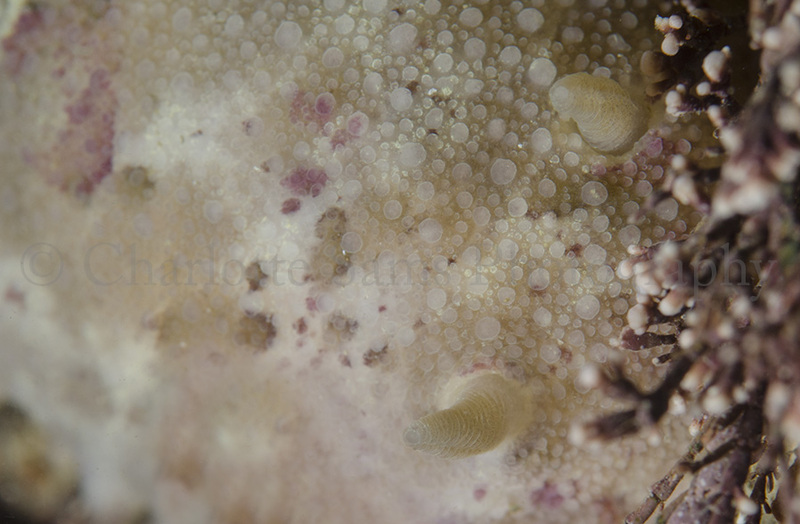 The sand particles with this narrow DOF look like snowflakes, and I’ve mentioned this before with another image, how I think it really works and only compliments the ethereal scenes you come across underwater. 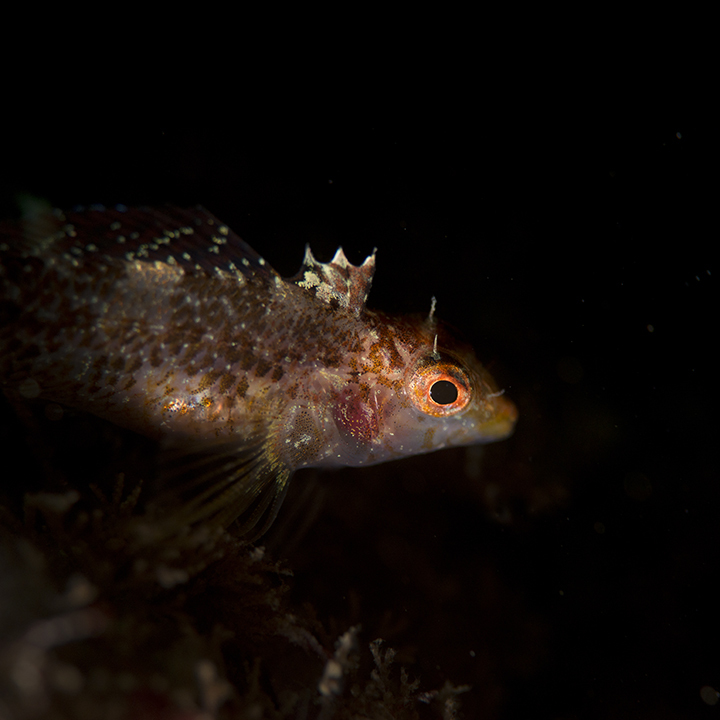 The second image is a female black faced blenny, and I was happy to achieve this image without any major editing; the spotlighting created from the strobes, and the black background from the aperture. Simple, and effective. I like these two as a pair, the colours do reflect eachother, and fit with my common theme of black, darker images. The square crop turned out much better than anticipated too, in my next post I’ll try and share a comparison of the crops. The MCZ project has now got twitter, Facebook and tumblr pages! If you’re on any of these please do support the project and give us a follow or like. Thanks to everyone for all the support for the project so far, I really do appreciate it! 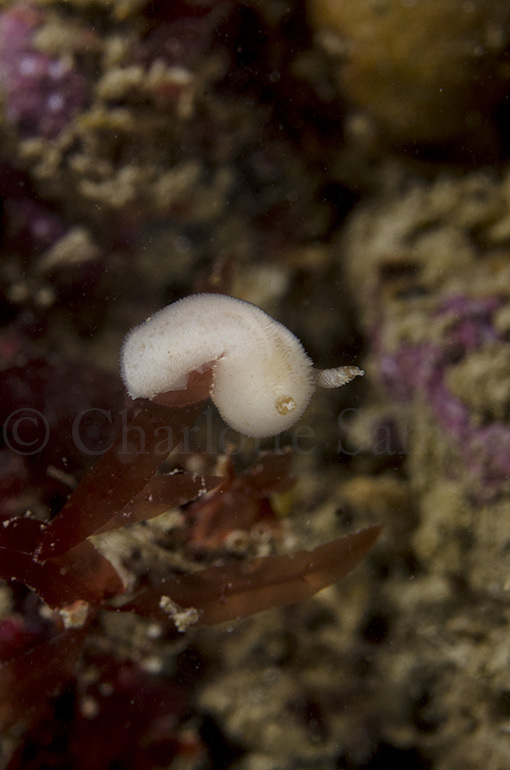 Here’s some discoveries from the latest dive at the same site as the previous post, including 2 more species of nudibranch and a sea slug that I had requested a sighting of earlier in the week – what are the chances! I was definitely feeling very happy and privileged after this dive. 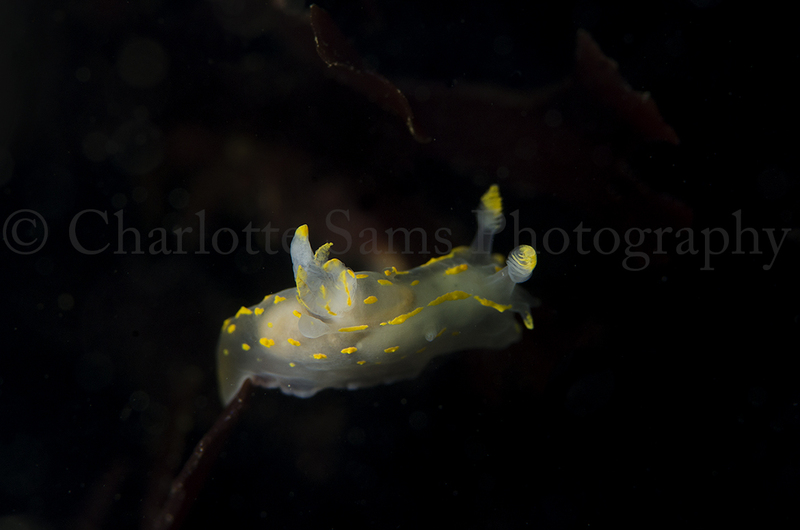 The first creature I saw actually provided some of the best shots, a new nudibranch for me, Polycera quadrilineata. These two shots vary to focus on the rhinophores, and then the branches upon it’s back. This was a little larger than most of the other nudibranchs sighted, probably around 3cm long, but the 105mm macro lens works wonderfully for highlighting this minute detail. This beautiful animal was fairly shallow and close to the shore, its amazing to think we have these creatures so close to home. 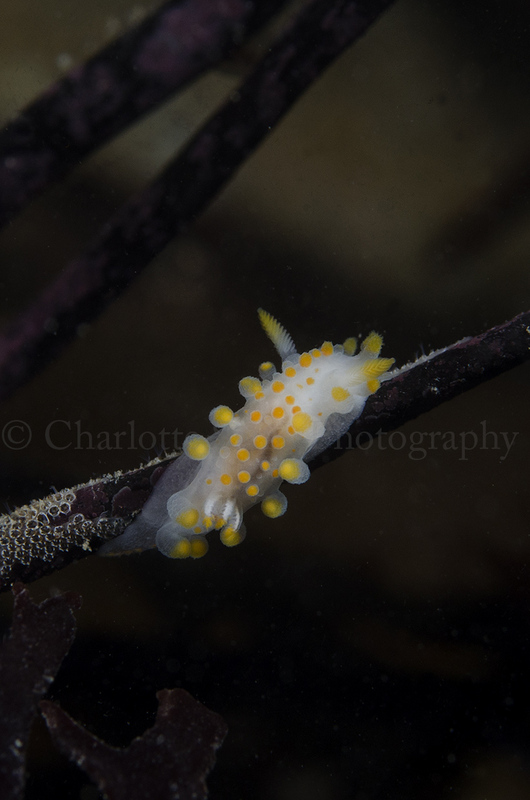 This nudibranch I believe is the same one featured in the last post, on a much smaller scale, as I’d estimate this one was just around 5mm long! 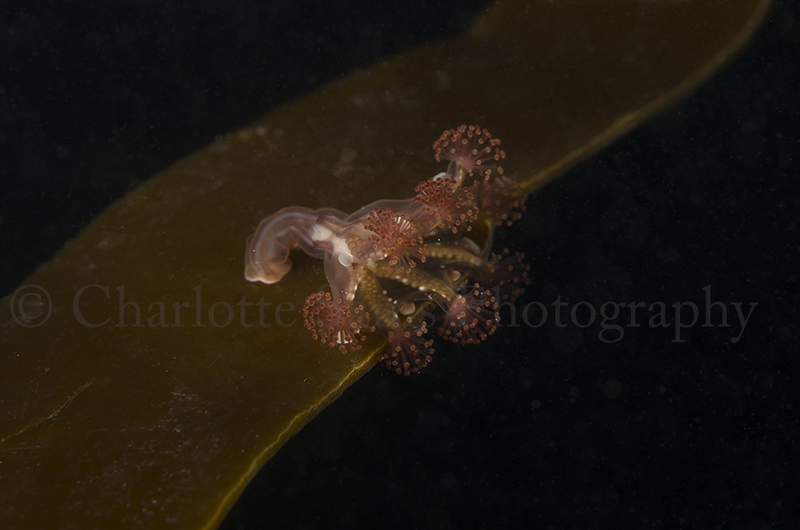 I mistakenly intentifieded this nudibranch as a juvenile of a different species, but it was pointed out to me that the species is Ancula gibbosa, another new one for me. I particualrly like the green colours in the background. 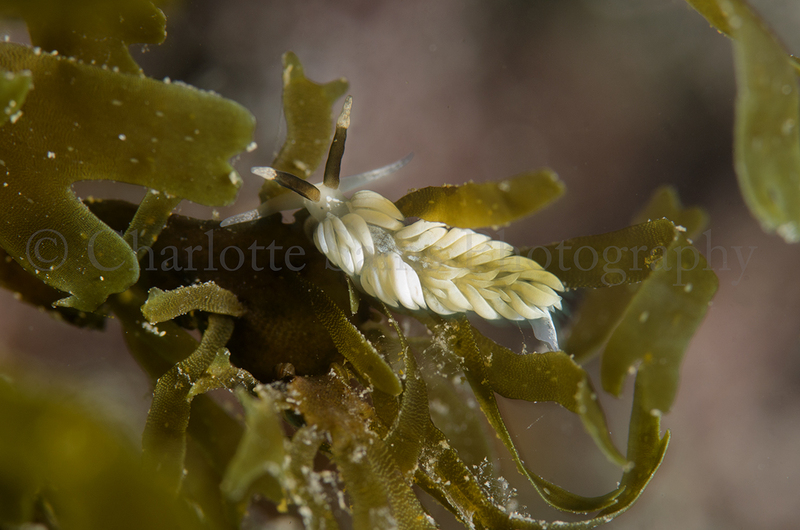 This nudi was actually floating around for a bit midwater until I took this shot, and as you can see it’s just about hanging onto the tendril of seaweed. 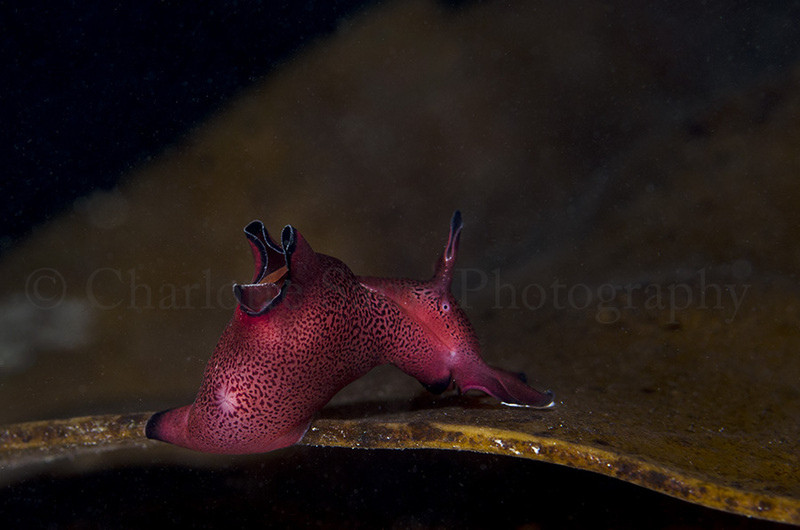 More sea hares! There was an area of about 1m squared which had a few within it, but unfortuntaley they all kept hiding behind this sea lettuce and weren’t the best photographic subject. 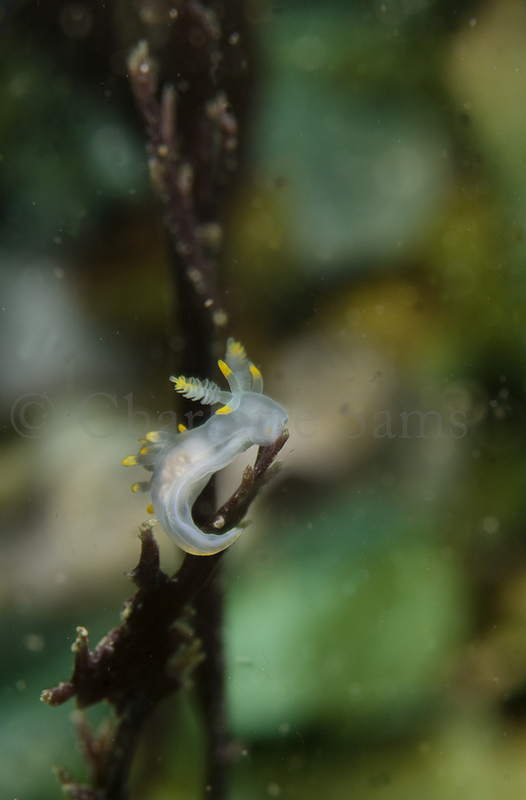 However, I did manage to see one which was really tiny, as small as the nudibranchs, which was pretty cool. The one below I think was about 2cm long. Another new species for me! 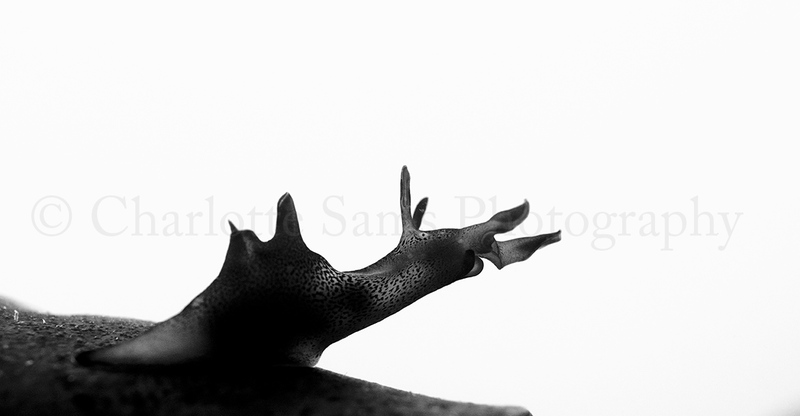 Favorinus branchialis, a very prettily shaped nudibranch. We saw a few of these scattered around the site throughout the dive, but this was the best subject as was a little larger and on some more open seaweed. 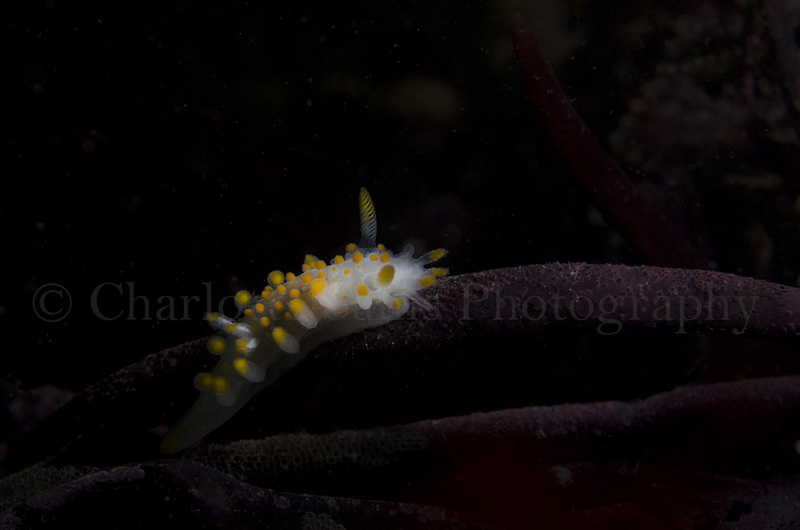 Though not as colourful as some, I like these types of nudibranchs with the cerata upon their backs. Other British species can look very similar to this shape but much brighter colours as well. 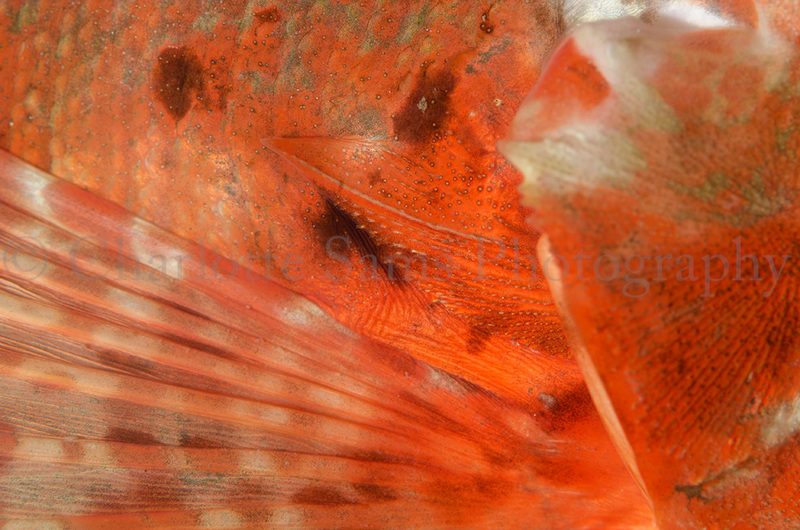 We also came across a Red Gurnard on the seabed, they actually almost crawl and feel they way along the sea floor, but generally are pretty static fish. This was no exception so I decided to take a few images to highlight the detail of it’s scales and the pattern near it’s mouth. 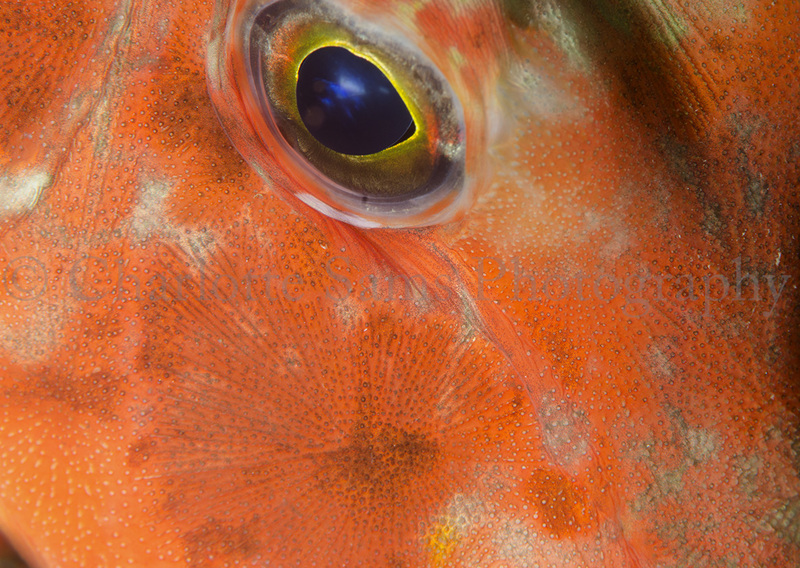 These images haven’t had any lighting adjustments, and the fish are actually this fantastic bright red/orange colour, which, incidentally contrasts quite nicely against their blue eyes. And this next find was quite special. When reading an ID book a few days ago I came across the green sea slug, Elysia viridis. Despite having a fairly conventional form, I thought I’d would be awesome to see because it has iridescent spots along it’s body. 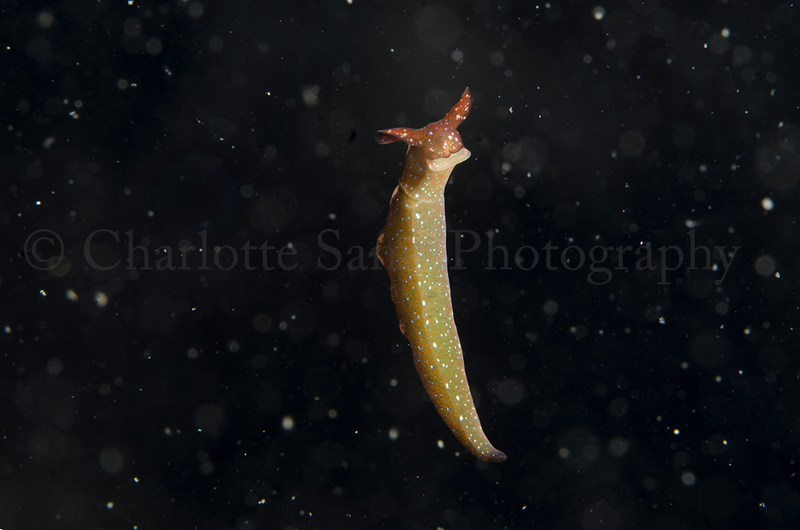 On our way inwards from the dive I saw this slug upon some kelp, another tiny creature, about 2cm long. I took one shot, but before I could take another it let go of the kelp and started floating, not even free swimming, in the water. This resulted in me floating upside down for a few minutes, trying to circle this little slug that was gently moving around, and trying to focus on it with the camera too. I was very happy when I imported my images that I succeeded in taking some in focus! Also, in this instance I think the particles in the water work against the back background, and they look slightly like snowflakes. Though arguably, some people would have probably preferred I cloned them all out, I generally like to stick to as minimal editing as possible. One parting shot. In the shallows, just as I was beginning to get myself out the water, my buddy waved me over to the rocks nearby. 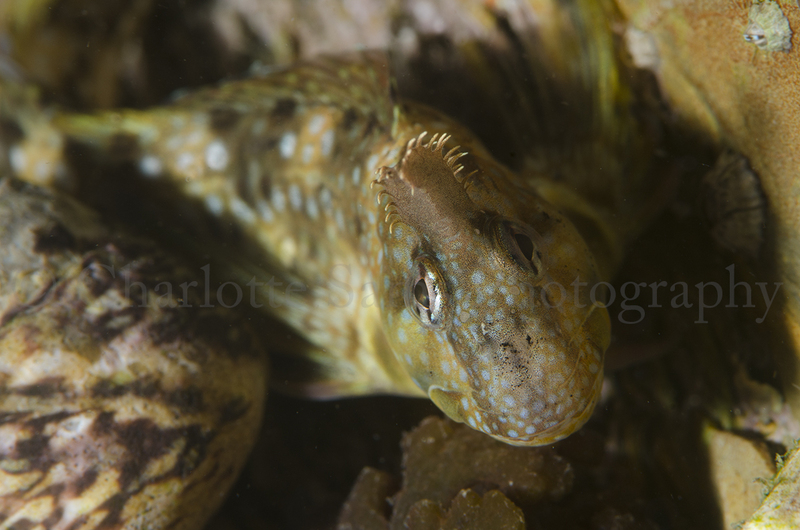 I turned my camera and strobes back on, and there about 2m deep (if that), right next to the shore, was Montagu’s blenny Coryphoblennius galerita, camouflaged on the rock. 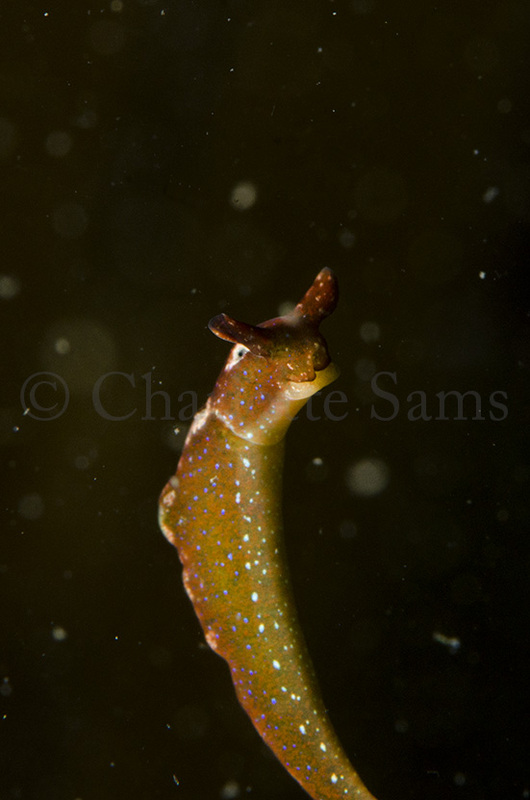 Most blenny’s have two little branched tentacles coming of their head, but this one only has one, similar to a crest. And, not to anthropomorphise, but the face on shot does make it look like it’s smiling. 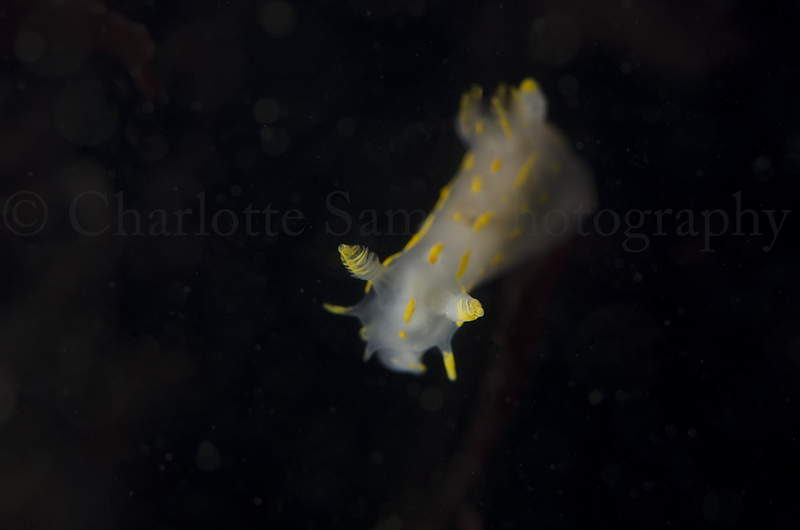 A quick bit of backstory… Before the last dive/shoot that I posted about, I had been (repeatedly) saying how I was requesting sightings of nudibranchs, sea hares and stalked jellyfish, purely because these are all quite awesome species in my opinion. If you read the previous post, you’ll see that we didn’t see any of these on my ‘wish list’, which was understandable, I thought it would be quite unusual to see them all in one dive, and still had fun anyway. 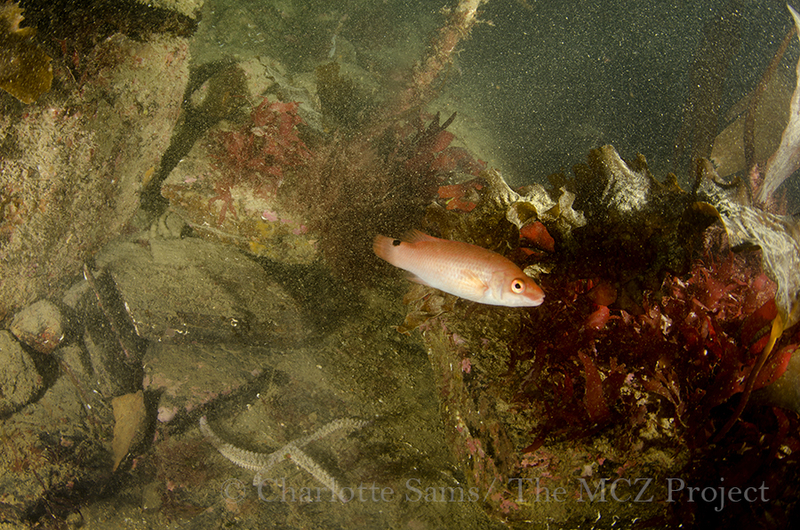 So this dive, I wasn’t expecting any of those above species, just the more common sightings of wrasse and crabs etc. Therefore, after being underwater for about 5 minutes, when my dive buddy pointed out a nudibranch to me I was very excited. 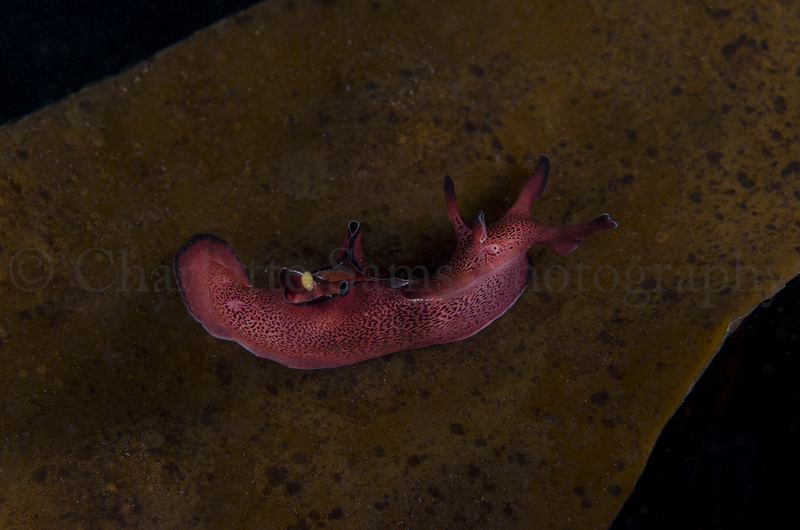 Especially because it was so big (for a nudibranch)! It was positioned in a particularly awkward place, meaning taking good photos was hard, and I’m aware this isn’t the greatest shot but I’m only using it for reference/ID here. 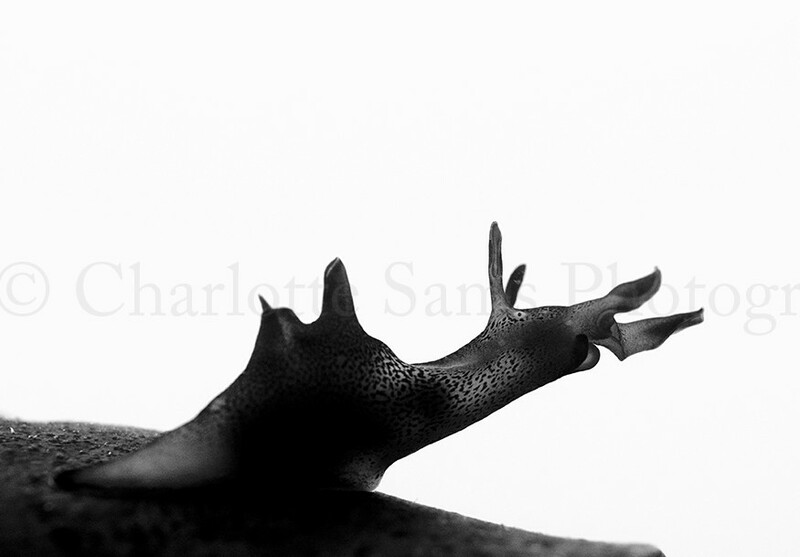 This species is a sea lemon, Archidoris pseudoargus, and was about 3 inches long. 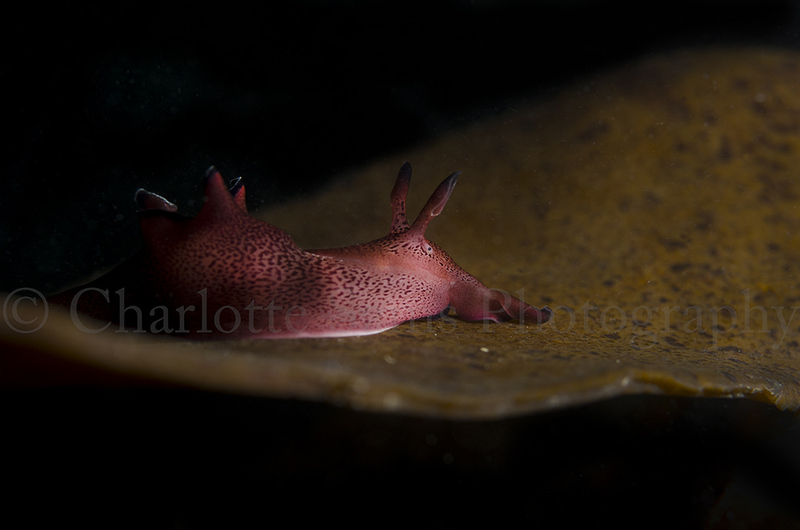 We floated on a little further, and then happened across another nudibranch! More excitement! This one was much much smaller, about 2/3 cm long. 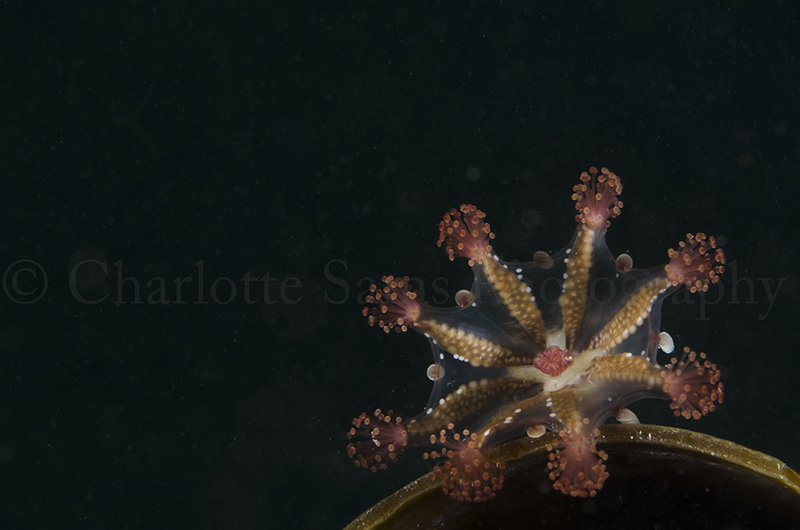 It’s not the most creative image, but from it the species was identified as Acanthodoris pilosa. There were a few of these around at other spots, all very tiny and awkwardly positioned, but lovely to see so many. 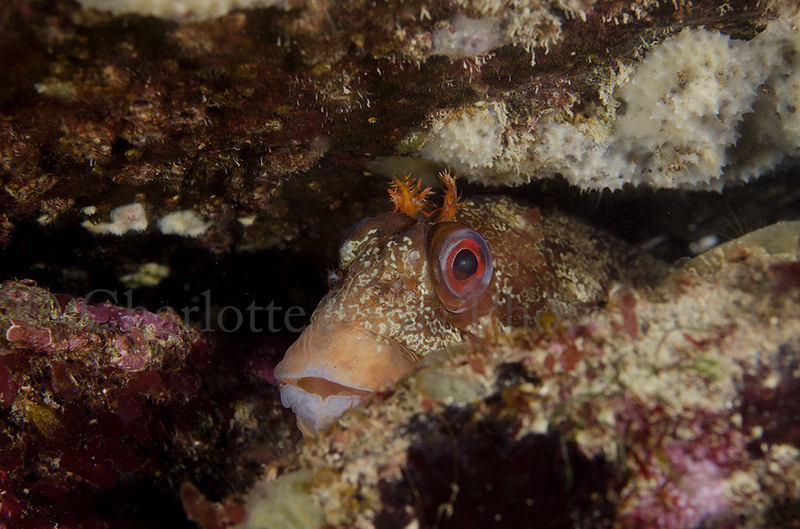 Next came a pair of tompot blennies, hiding down a crevice between some rocks. (I know there’s only one in this photo but the other one is hiding just out of sight) These are a common fish to see, especially in this kind of habitat as they tend to like hiding out between rocks like this. When diving you tend to swim really slowly, and when I have a macro lens I naturally slow down even more because of the nature of the photography, and after the sightings of nudibranch previously I had my eyes geared up. So managed to spot a third species of nudibranch! Even smaller than the last ones there was a group of 3 or so, ranging from just under 1 cm to just under 2 cm (I think), which is the one I have images of here. Much prettier than the two previous species, this is Limacia clavigera, an orange-clubbed nudibranch. 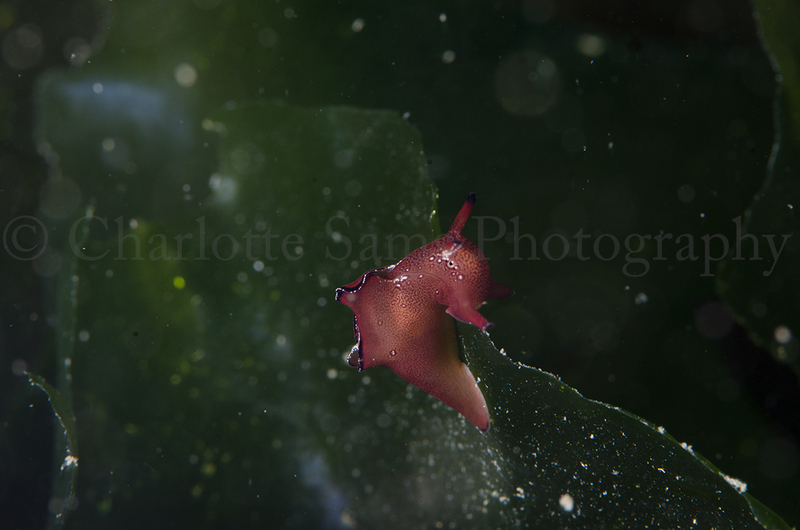 After the nudibranch crawled away to spot where I couldn’t photograph it, we swam on, and out of the kelp alongside appears a sea hare! (Aplysia punctata) A smaller one than I’ve seen before, I guessed it was about 1.5 inches, and once illuminated properly by the strobes, the colour against the kelp was fantastic. This was the best subject to work with, being in an accessible place, and so I spent more time with it than anything else, allowing me the opportunity to try out some different techniques, and get a number of shots I was happy with. By this point, I was extremely happy with all our sightings, though beginning to get more than a little uncomfortably cold. (70minute dive in 10 degrees water & a wetsuit – divers will be able to relate!) We turned back and after a few more minutes, my buddy waved me over, and what do you know.. there was a stalked jellyfish! (Lucernariopsis campunulata) It was getting a little ridiculous at this point, I honestly barely expected to see one of the species from my wish-list, let alone all 3 of them! I only managed a few shots of the stalked jellyfish before cold took over and I was struggling to work the camera, but here it is. Doesn’t look your typical jellyfish right…arguably almost like a minute squid in appearance. These creatures are about 1 inch long and act like an upside down jellyfish, attaching to kelp and seaweeds, and then having it’s tentacles facing upwards. Also, massive thanks to Matthew Thurlow for being my buddy on this dive and spotting some really cool creatures! I know this post has been more anecdotal than usual, but I just wanted to share my excitement for the whole dive rather than talking about the images as much. My next post shall be different. I plan on visiting this site again for another dive later this week, so fingers crossed for some more amazing marine life. So this is the first Cornish dive I’ve had this year, due to the storms creating little to none visibility up til recently. 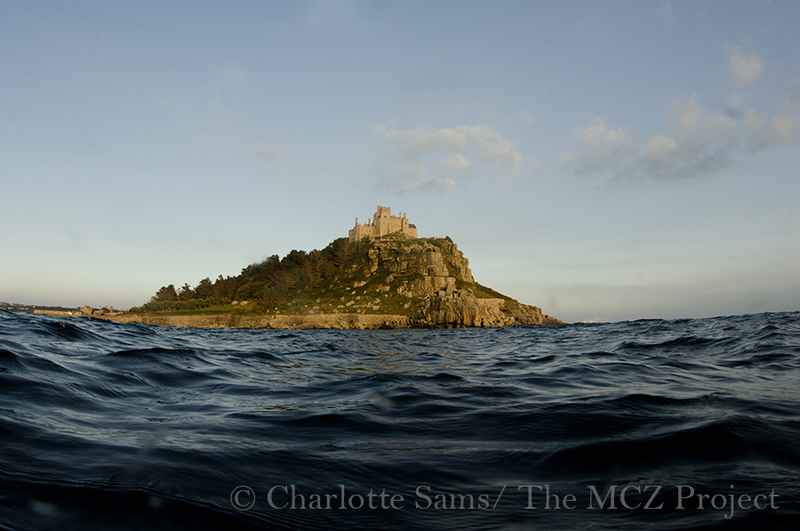 And the cold water was a bit of a shock at first, but I was determined to stick it out and get back into the swing of underwater photography. Just a local shore dive out of Falmouth, the site often provides us with sights of dogfish and rays, fairly large species that we surprisingly saw nothing of this dive. Nonetheless there is always something interesting to see underwater, so I had plenty of subjects to practice my photography on. There are hundreds of anemones around this area, of varying species too, and their colours are absolutely amazing! The variation between them and the bright colours & patterns are really lovely; you could quite easily spend a whole dive focusing on photographing anemones. I never do these triptych things, but in this instance it helps show a few different images all together, and you can see what I mean about the colours! These species are Dahlia anemones, Urticina felina. Painted topshells, Calliostoma zizyphinum, are often found washed up on beaches. 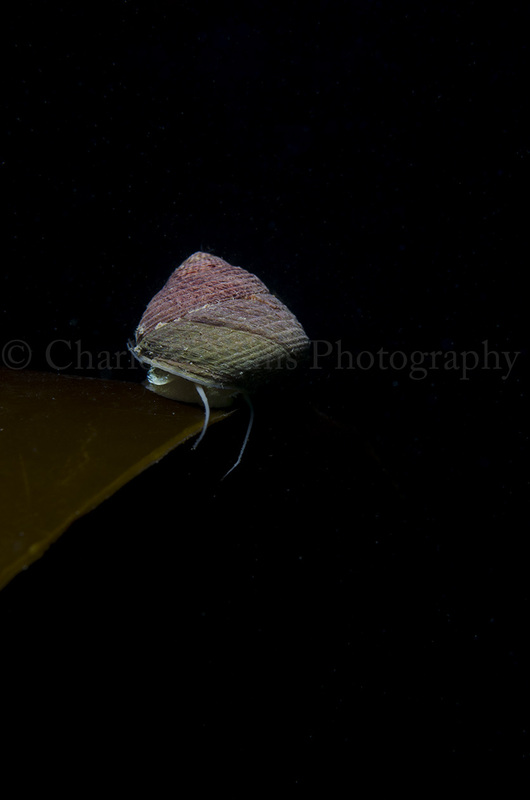 They range a lot in colouration, and why I chose to include this shot was the fact that the foot is particularly visible and actually kind of matches the shell here. 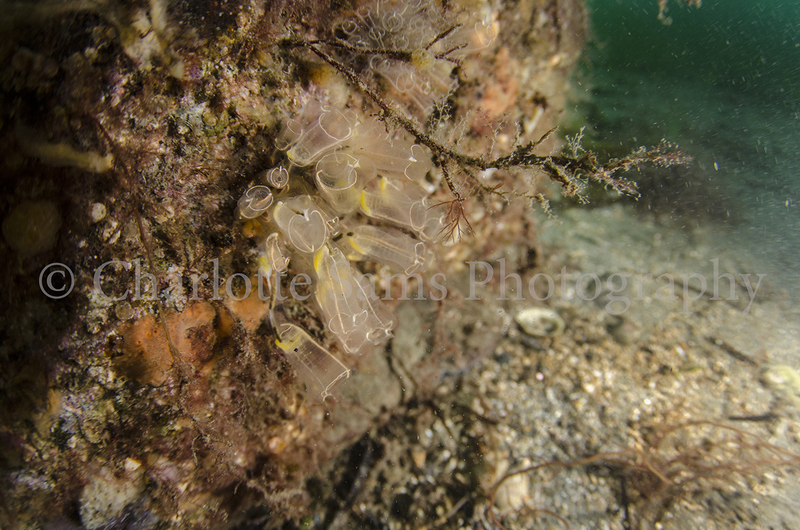 As you can see from the shot this one was clinging onto a piece of kelp, which is very common to see underwater. 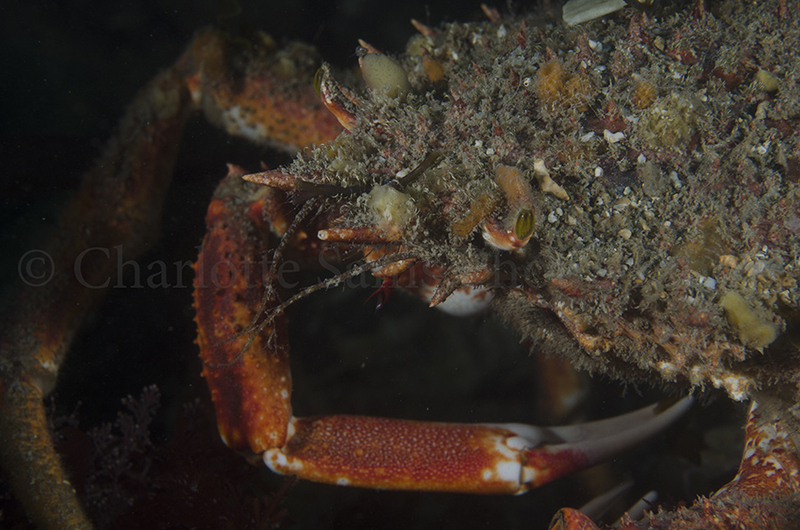 Along with sightings of a few shore crabs, an edible crab, and a very angry velvet swimming crab, we also happened across this spider crab, Maja squinado, who appeared to be feeding on something, it wasn’t clear what. 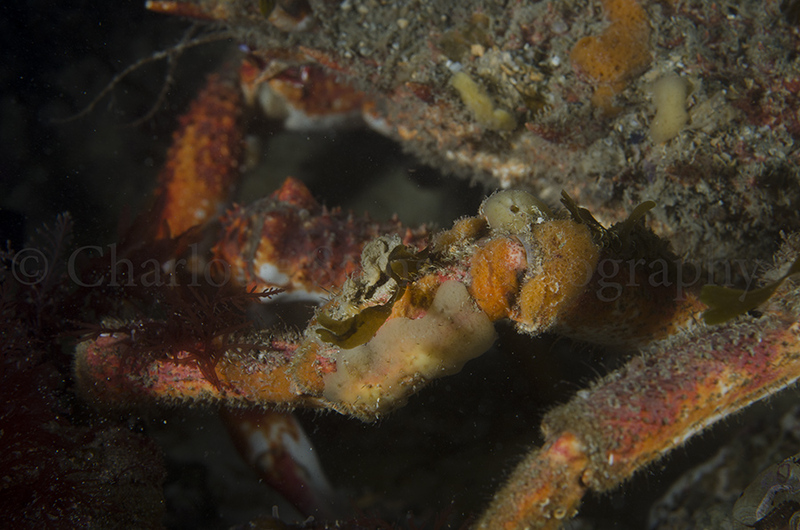 The first shot here illustrates the fact that it’s feeding on something, and the second image I wanted to highlight the body of the crab more than anything, focusing on the leg here. 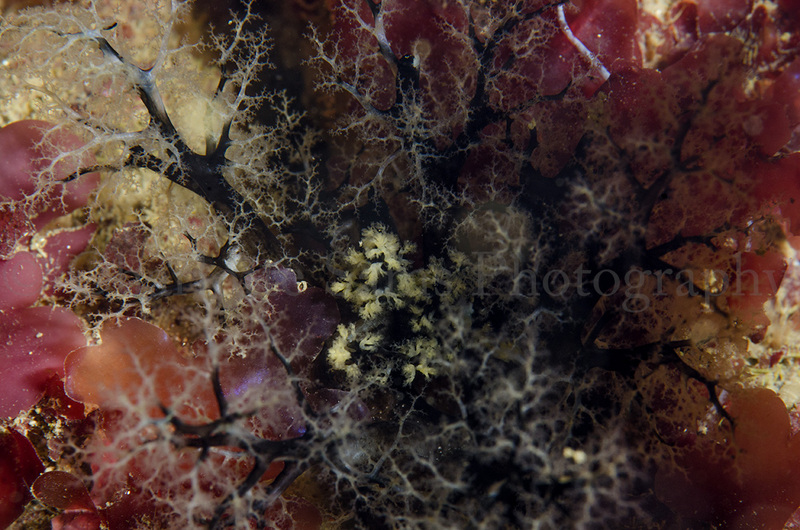 Similar to decorator crabs, they have life actually growing and living upon them, you can see the flecks of sponges in these shots. Next is this snake pipefish, Entelurus aequoreus. 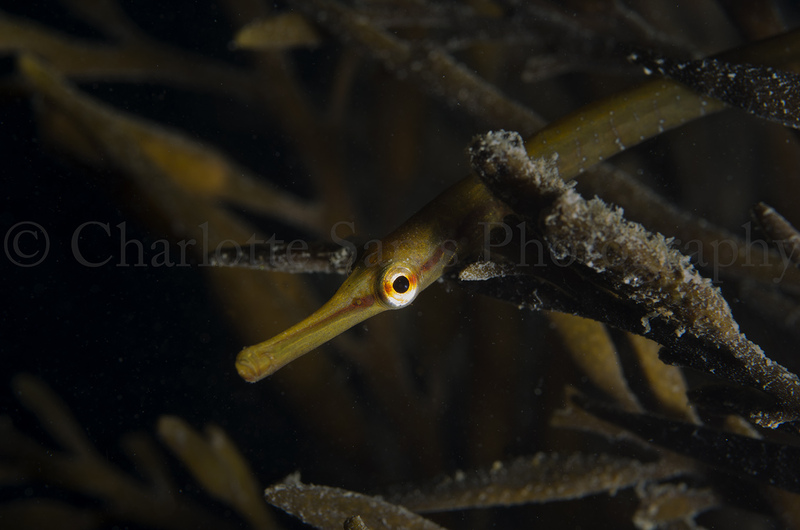 I actually came across a juvenile of these in a rock pool the other day, and was confused for a while on the species as it’s visually quite different to the greater pipefish we often see around these parts, being much smoother and, unsurprisingly, snake-like. 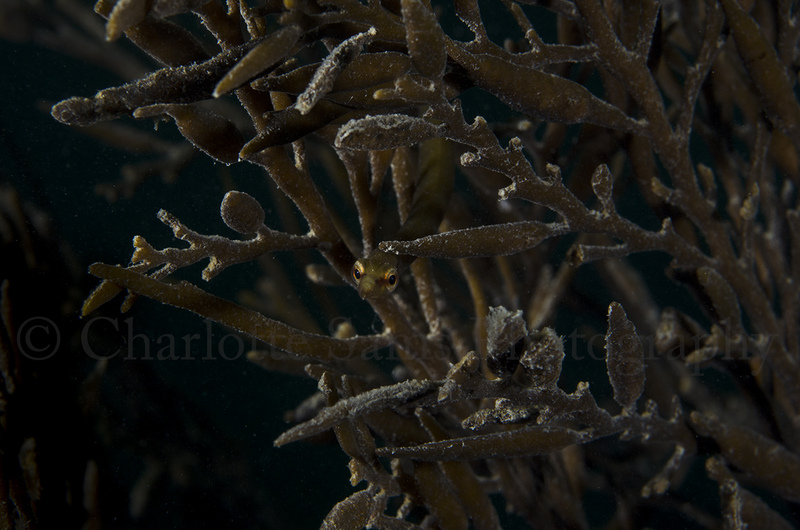 This first image shows how I very almost swam right past it, due to the camouflage within this particular seaweed. 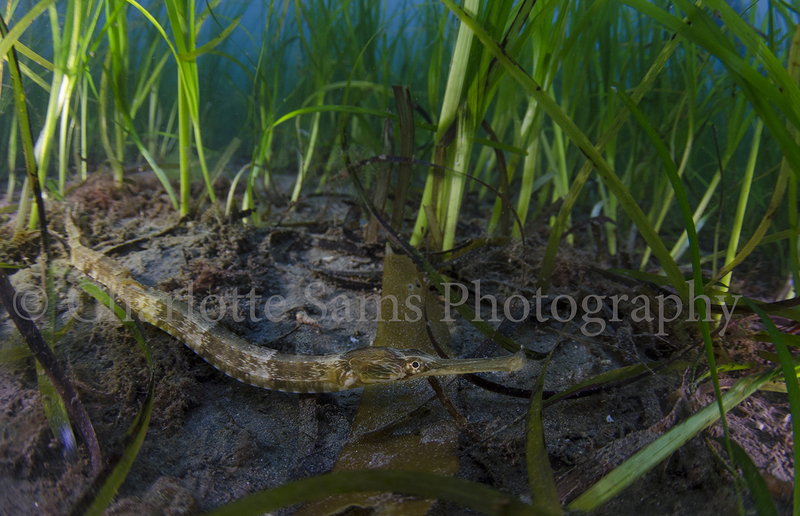 Spot the pipefish! The second shot simply shows what amazing and beautiful eyes they have. 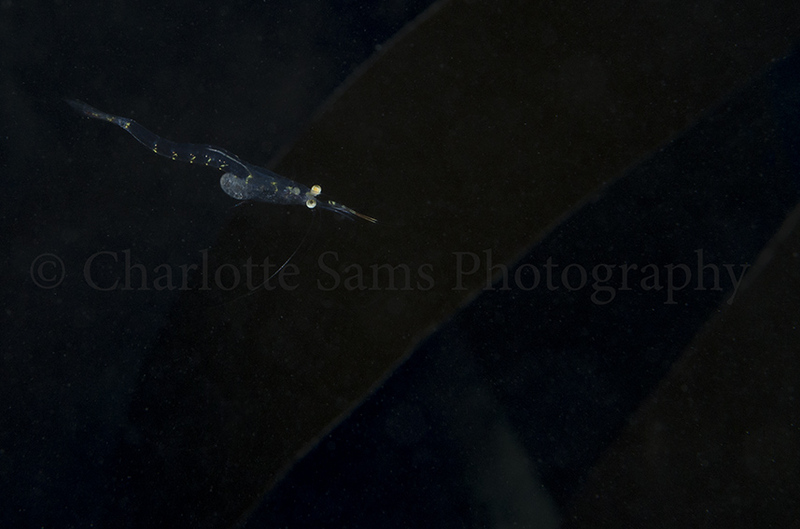 Finally is an image of one of the absolutely tiny prawn juveniles that we came across. The image doesn’t show perspective but you’ll have to believe me that this was only about 1.5 cm long. They were darting around like crazy, so this was one of only I think two shots that actually captured it in focus. 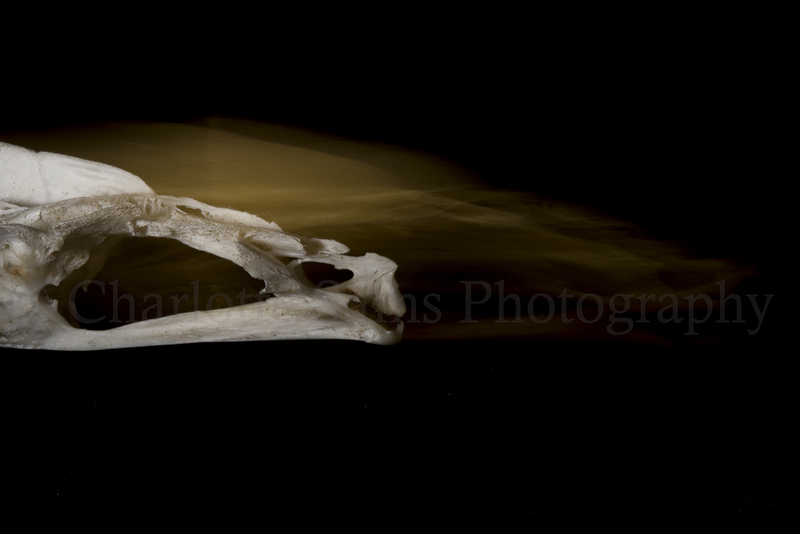 With the dark background here the transparency of the body is visible, which as it ages will become ore opaque. From the patterns I’m pretty sure these were common prawn young, which will develop into pretty purple and yellow striped crustaceans as they grow. So that’s all the images from this dive, all commonly sighted species, which could in fact be found either rock pooling or snorkelling should you fancy it in these lovely warm waters of 12 degrees! 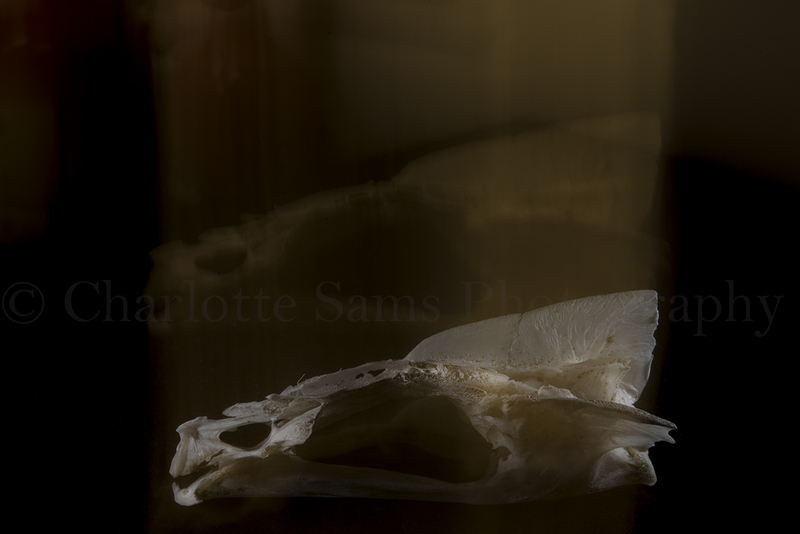 A fair few months ago, whilst on a dive, I came across a fish skull on the seabed. I thought, this is great! I can take this into the studio and take some more fine art imagery with it, to contrast against my usual more documentary/editorial style of working. So…about 6 months later, I finally got round to it. My original plan was to use some 5×4 film for making these images, but due to the kit being unavailable at the time I changed to a macro flash set-up, which proved probably the better option to start off with. It’s been a long while since I’ve done any studio or still life work, and I enjoyed it so much more than I thought I would. 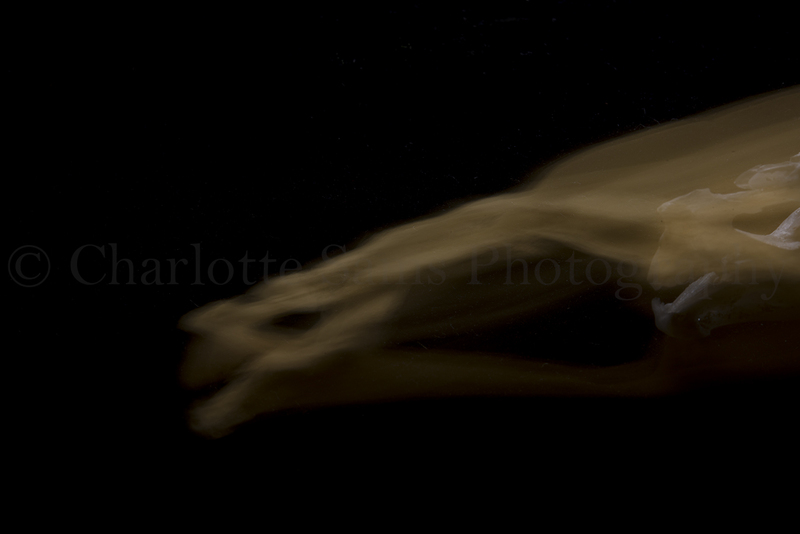 I’ve been getting pretty frustrated at not being able to take the underwater images I would like to recently due to lack of diving, but this shoot definitely cheered me up! 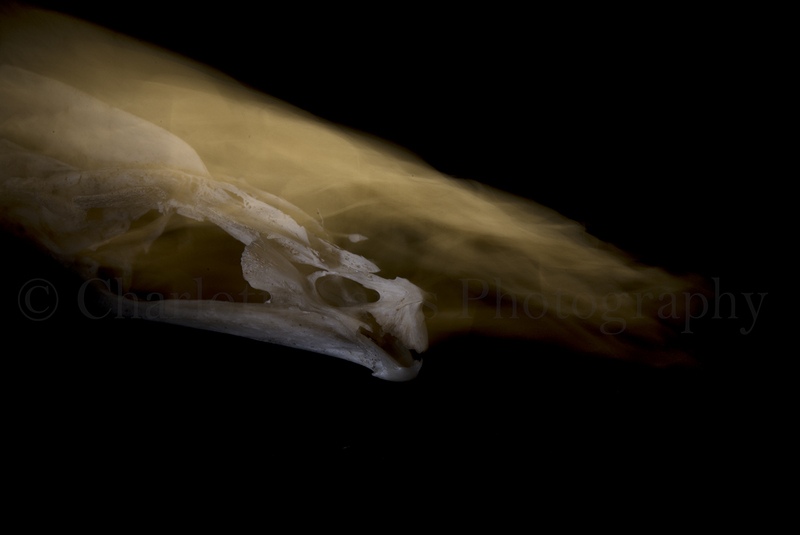 A lot of people seem to have this slight fascination with skulls, I’m not sure what it is about them that appeals to us, I think it’s related to our interest in death. 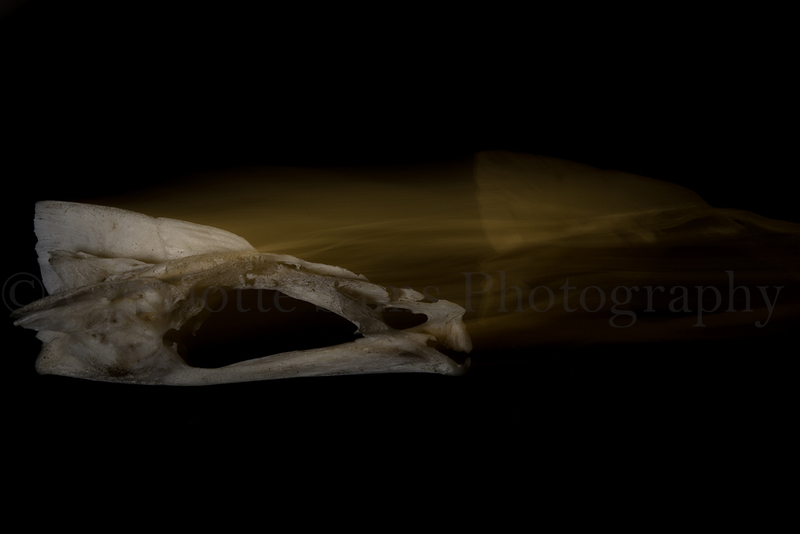 Either way, I am also one of these people, and very much enjoyed scrutinising the form of this fish skull. There’s a few things I love about this style of photography; primarily the fact that using such slow shutter speeds means there’s an element of unpredictability, and you can never be sure how your image is going to turn out, (something that’s unusual to a lot of us in this digital age). This also means a lot of the images don’t work, and therefore when they do it’s even more exciting. This reminder of analogue photography is replicated a little through the sepia colours too. 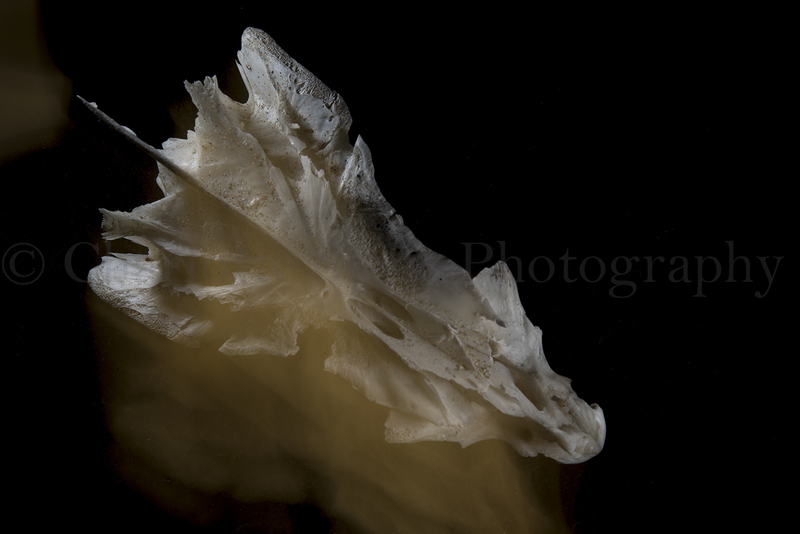 I think the smoky textures around the skull create the impression of a dragon, something that I find quite pleasing. Who doesn’t like dragons! 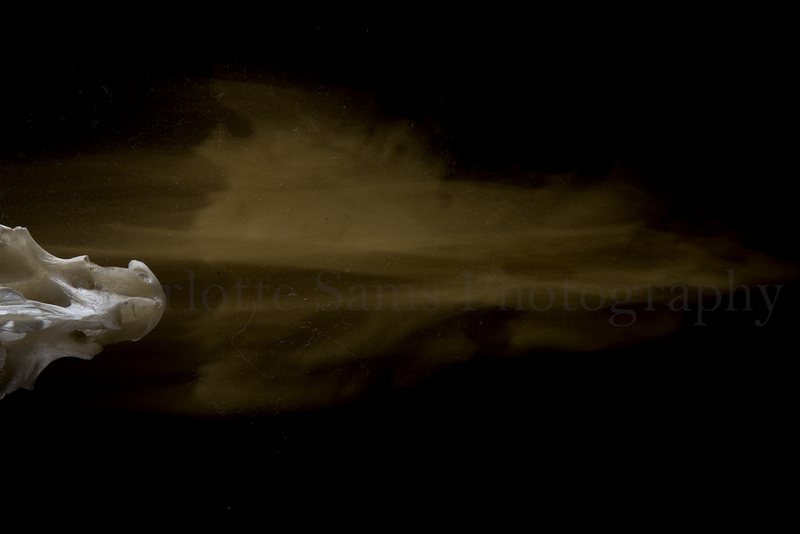 It’s been a while since I’ve posted, now I have a facebook photography page (see – https://www.facebook.com/CharlotteSamsPhotography) I’ve been updated more on there than on here. It’s all about finding the balance! 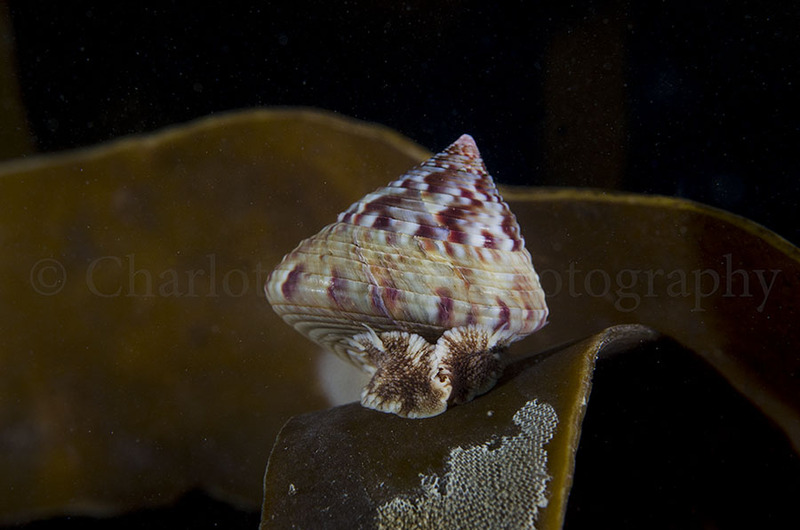 This post is on our dive last night at Durgan, on the Helford river. 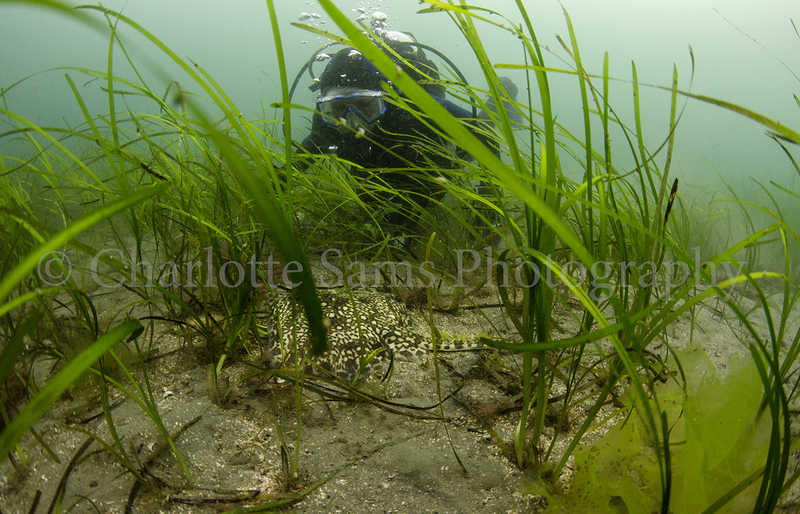 It’s a lovely site with eelgrass beds, so an interesting change from rocky/sandy sea floors, and more unusual wildlife. Last night we saw a thornback ray, a dogfish, pipefish and various other sightings. Lots of fun! 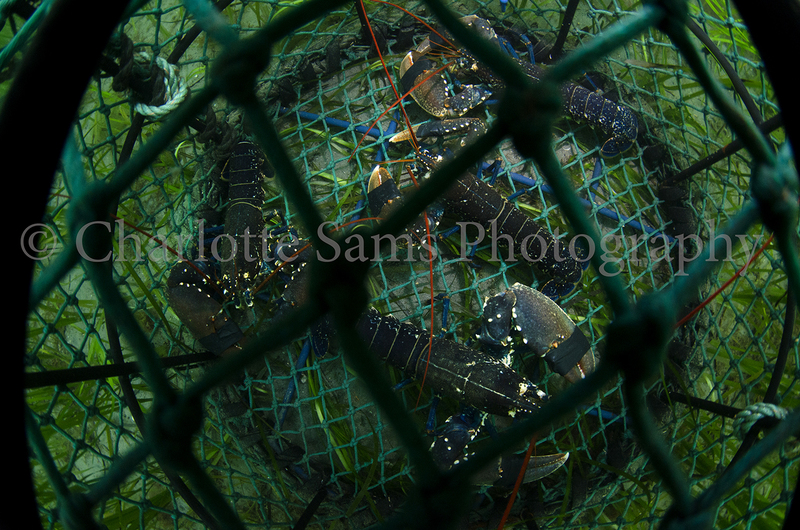 We came across a lobster pot. This wasn’t the kind of image I was after but it’s still quite an interesting shot. The strobes were especially hard to position to fire properly through the netting. Charlie and the thornback ray! 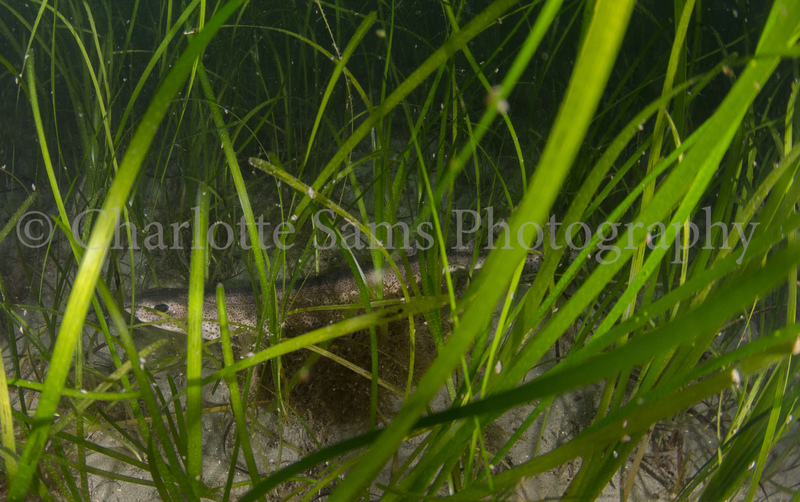 This was another challenge to photograph because the eelgrass kept getting in the way and blocking my shots. 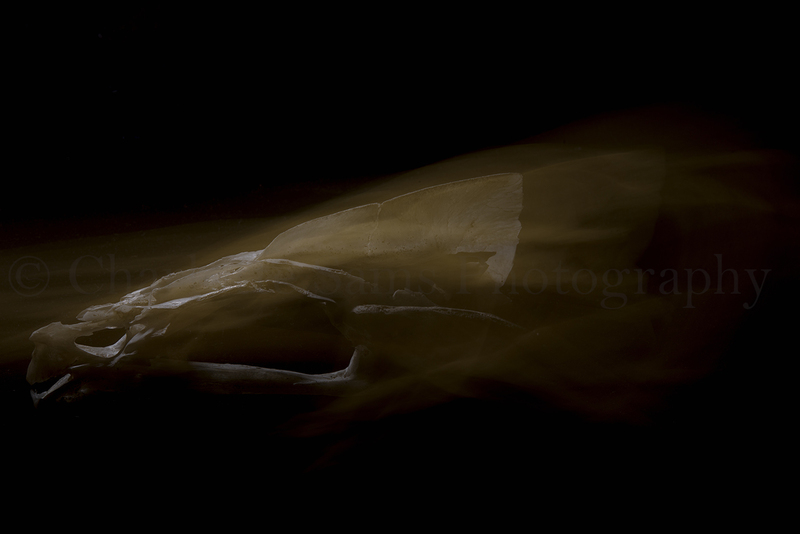 I didn’t want to stress the ray so only took a few images before leaving it alone. 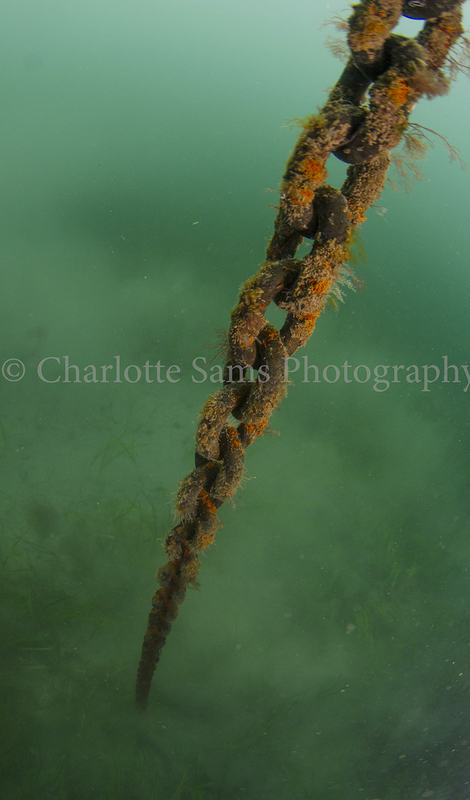 Possible project images; rusty chain and sea squirts. Spot the dogfish! 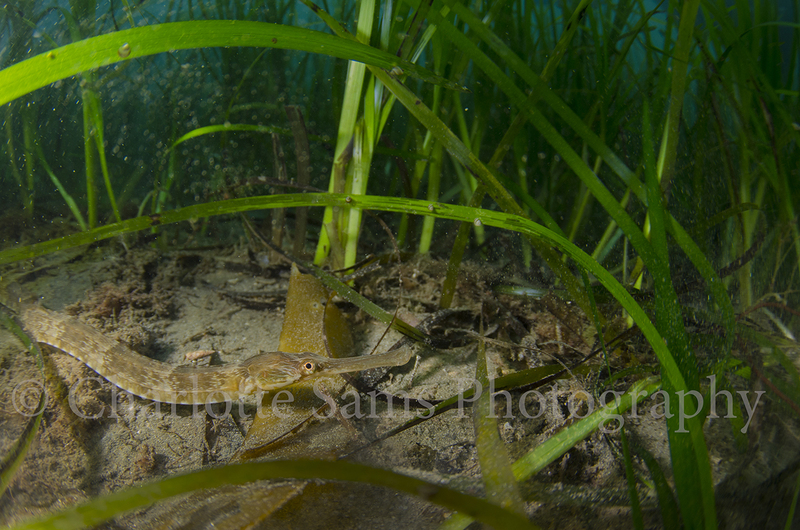 Again, the eelgrass got a bit in the way here but I love the incredible bright green colour when the strobes light it up. 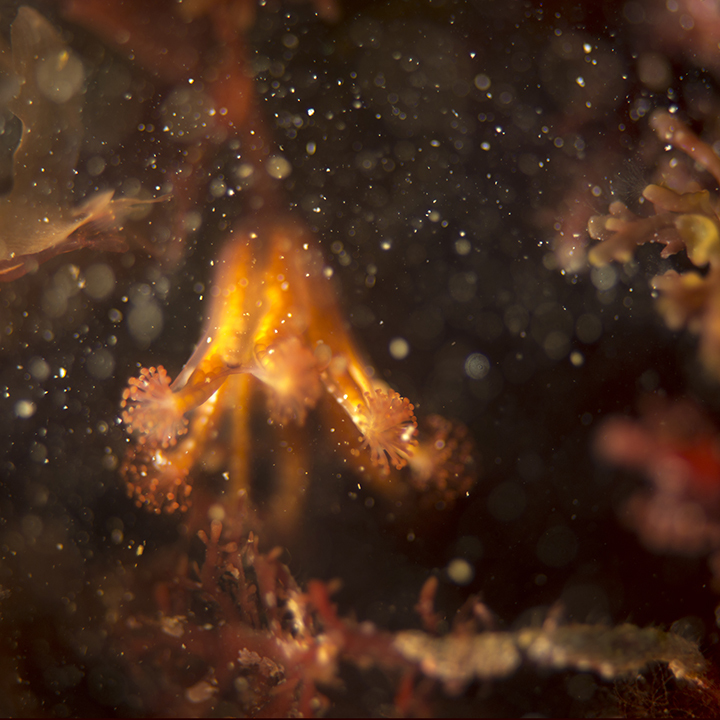 This is my favourite of the dive, a fairly common animal in british waters but interesting nonetheless. This image optimises Durgan as a dive site, habitat and wildlife.